And a Lot of Music…Can Go! 2 Parent Guide Books which include the children’s books and activities for each unit, and an instrument. $15.50 to be paid with registration. Parents join their children for the last 8-10 minutes of class each week. Siblings are welcome. “Look Mom! I’m Flying!” For the preschool child, imagination is everything. In a Level 3 class, your preschooler’s natural love of music, storytelling, and imaginative play is combined to create a remarkable learning process. Your child will love pretending to be a tightrope walker, a leaf falling from a tree, or a dragon traveling to a castle, all with music as the springboard. Little will your preschooler know that he is using creative thinking that develops language, sensory, motor, and cognitive skills. He will delight in singing new and familiar songs that develop pitch accuracy. His listening skills will be honed as he intently listens for cues to let him know it is his turn to play his instrument in an ensemble. Level 3 allows us – and you—to nurture your child’s budding musicality, creativity, and love of music while laying the groundwork for future music study. We look forward to you joining us during the last ten minutes of each class! "My four year old has had such an enjoyable year in the Laugh & Learn class! It was a big step for her to move into the “big kid” group, but I have seen her blossom in so many ways because of it. She has really started to learn a lot of musical concepts this year and I can tell she understands music much better than I would expect from a child her age. There is a big focus on pretend play, which not only keeps her entertained, but has also helped develop her creativity and imagination. I love the format of Laugh & Learn and how it allows the children to work on social skills and gain a sense of independence for most of the class, but the parents still get to participate towards the end. It has been a great way to foster her love of music and I will always be grateful for the all the ways Kindermusik has helped her grow through the years!" What will my preschooler and I experience in a Kindermusik class? Most three and four year olds love to talk! We foster your child’s language development by encouraging the sharing of ideas, by enjoying interactive story times, by creatively changing the words of songs, and by giving your child the opportunity to speak his thoughts, feelings, preferences, and observations. We celebrate your child’s exploding language development! Your preschooler will delight in using his many voices through fun songs, vocal exploration, and play. He will explore his vocal range and continue to hone his skills at matching pitches. Amazingly, singing will enhance your child’s memory and recall, physical development, creativity, and socialization! What child doesn’t love to play instruments! They are just plain fun! However, there is a lot of learning taking place when we play instruments in class. 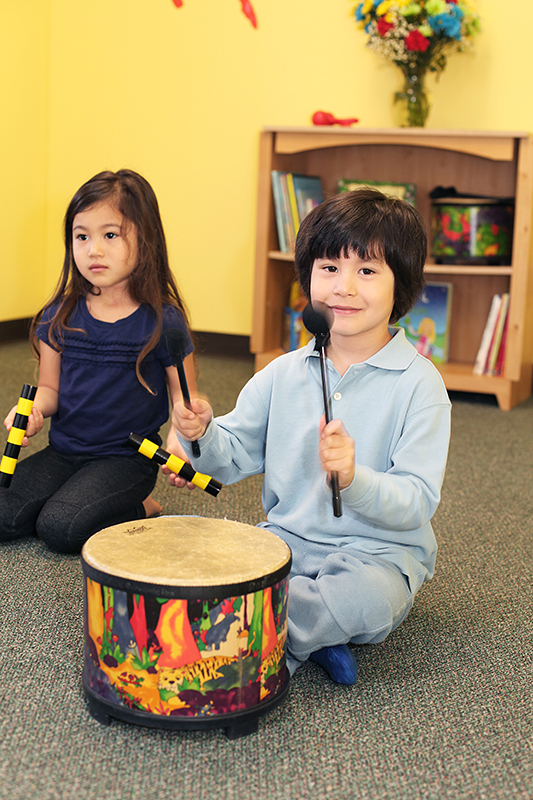 Age appropriate instruments provide opportunities for your child to explore steady beat, ensemble, timbre, and other musical concepts. Energy and movement permeate a Laugh & Learn class because exuberant preschoolers love to move! 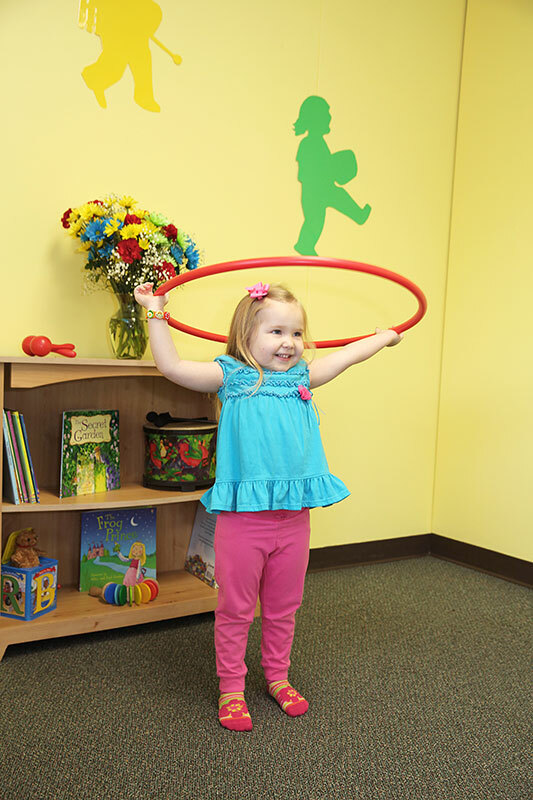 Many preschoolers begin to demonstrate steady beat competency through movement. They also love to express themselves through creative movement. 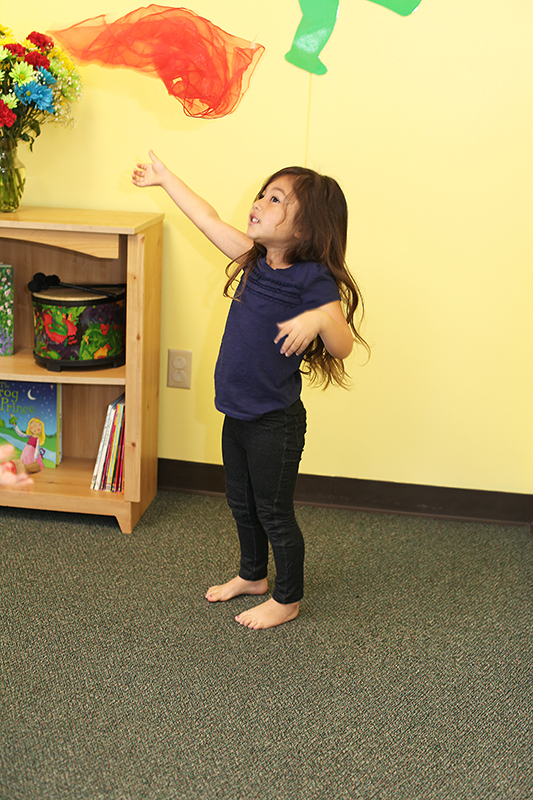 Dramatization to music is a favorite activity for the young preschooler and they delight in pretending to be sunflowers dancing in the wind or driving a car on grandpa’s farm. Singing games and circle dances are great social fun when parents join us at the end of class each week. Your child is learning to be self-sufficient in a group setting of peers, while many times still needing the affirmation and emotional security provided by you. Laugh & Learn fulfills both needs by incorporating time for peer interactions and time for sharing music with you. During sharing time at the end of each class the two of you will create special memories together from Kindermusik class. Get ready for lots of ribbity-hopping, trumpety-stomping, and oinkity-rolling! Animals a-Dancing uses the movements and sounds of frogs, elephants, and pigs to emphasize how many movements you can make with your body and how many sounds you can make with your voice. You will love moving every which way while singing the songs of our animal friends. Be sure to pack a sense of adventure for this action-packed trip to the mountains and the beach! Gross motor practice will take a front seat as children ride bikes, hike in the mountains, scuttle like a crab, and fly like seagulls. Singing, instrument play, creativity, and movement all bring the learning to life. Pack your bags, it's time to go Out and About!